skirt:vintage, belt:kate spade (old), blouse:j.crew (on sale now), wax-wear jacket:j.crew, kallie wedges:kate spade, sunglasses:ray ban, bangles:kate spade, stella&dot, stella&dot c/o meredith king, cooper watch:kate spade. don’t forget to enter the giveaway below….who doesn’t want to snag up some cute kate spade earrings! plaid is my fave. love the way you styled it here. This look is so polished! You look great. LOVE LOVE LOVE the top and bow belt. Plaid is seriously having a moment right now and you have captured it. Thanks for stopping by Pursuit. OMG-LOVE this outfit! 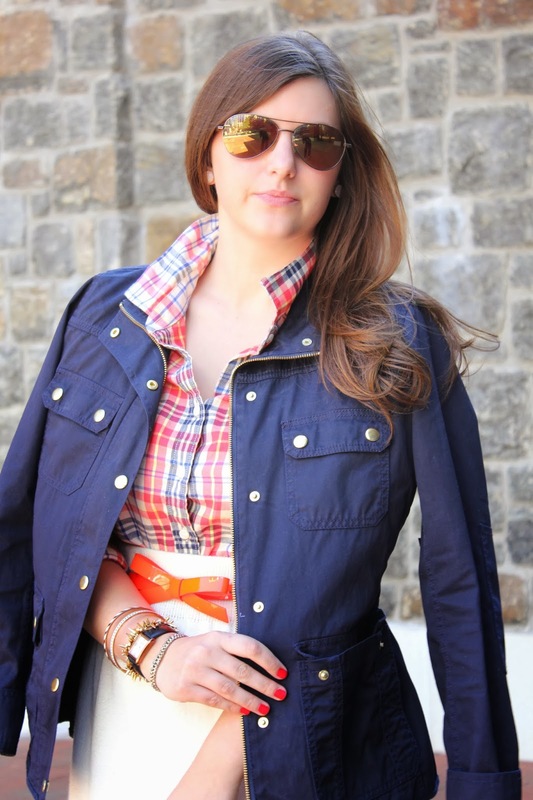 Love the plaid, the belt, and the jacket so, so much! I just got the jacket and I'm swooning over it. 😉 Adorable! I love this look! I need to get a plain shirt! Thanks so much for your comment on my blog! I love yours! love it with that lovely coat. Love your purse! And the shape of that skirt is so lovely! cute look, love the bowtie belt! You look great and totally like you work at Kate Spade. Just love this look: chic, fashion forward but with classic touches. 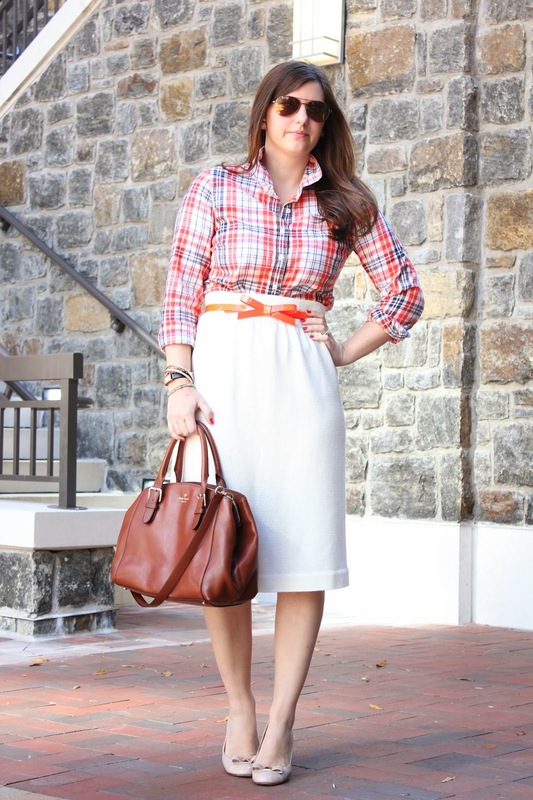 Love the plaid shirt and that adorable bow belt! You look so cute. 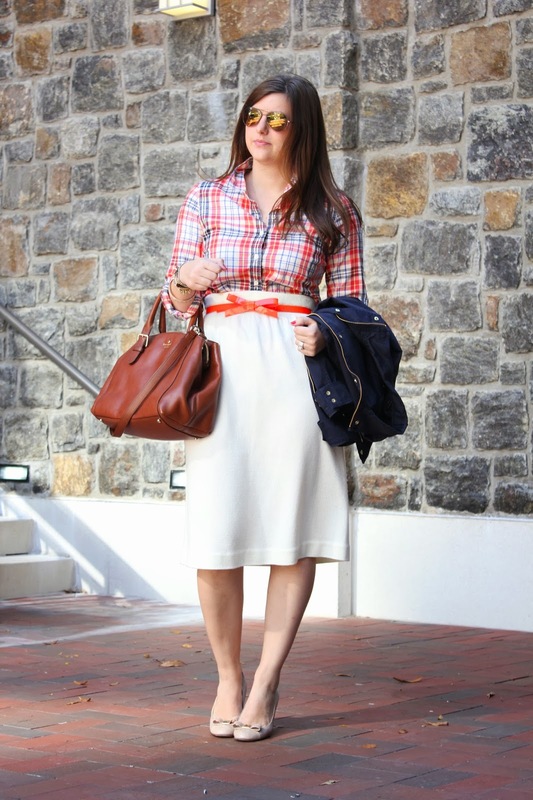 plaid, a bow, and a white skirt? I could not love this anymore! Super cute! I love the dressed up plaid! This is absolutely STUNNING! I love everything about it!